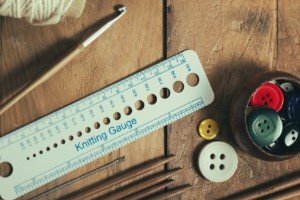 What is Gauge in Crochet & Knitting? Why do I have to care about gauge? Very simply, if you don’t check gauge, you will be knitting and crocheting blind hoping the project turns out the correct size, without knowing if you are close or way off until you are done, or nearly done. If you don’t enjoy starting over or being disappointed with your results compared to the pattern design, then ignore gauge at your peril. So what three things (mainly) affect gauge? The yarn weight, the crochet hook or knitting needle size and the “tension” you crochet or knit with. Some knit/crochet loosely and some more tightly. In either case, try to at least be consistent… compensations exist for either loose or tight to achieve gauge. If you are too loose and your gauge has too few stitches per inch, go down a hook / needle size or two until you achieve the target gauge. If you are too tight (most common) and your gauge has too many stitches per inch, go up a hook/needle size or two until you achieve gauge. To check your gauge, follow the suggestion of the pattern for making a sample swatch (for example Stockinette stitch for knitting or sc block for crochet) and measuring. Then adjust your hook / needle as described above if necessary. In “extreme” tension cases only, you may need to try altering your tension style or even change yarn weights (if an option). Which gauge should I follow – yarn or pattern? Short answer, the pattern! The gauge on the yarn label is only a suggestion as is the hook / needle size recommendation. The pattern designer will provide the gauge (and hook / needle size) that best suits the pattern they have created using these same parameters. To get the same results as the pattern promises, always follow the pattern gauge. https://www.calichicbaby.com/wp-content/uploads/2018/03/CCP-site-logo2.png 0 0 Cali Chic Baby https://www.calichicbaby.com/wp-content/uploads/2018/03/CCP-site-logo2.png Cali Chic Baby2019-04-01 22:20:212019-04-02 22:44:31What is Gauge in Crochet & Knitting?